[Ed. Note: The most recent update is here. Previous updates, from earliest to most recent, are here, here, here, here, here, here, here and here. UPDATE 22:18 GMT: Reports coming in that Zawiya is “under attack” right now. Not sure how they’re defining that yet. Fatima, one of the innocents. Video of the “underground prison” discovered in Benghazi has been posted. UPDATE 20:53 GMT: Via Twitter, Libyan bloggers are reporting that text messages sent to residents of Tripoli in the past 30 minutes by Libyana, the country’s leading cellphone provider, advised them that a local cleric issued a fatwa against watching television channels “like Al Jazeera,” that incite bloodshed. UPDATE 19:50 GMT: AFP is quoting a Tunisian official saying that nearly 20,000 people have fled Libya into Tunisia over the past four days. 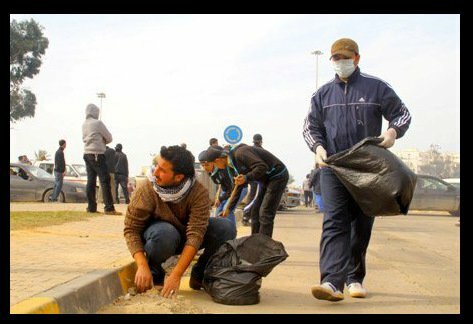 UPDATE 19:42 GMT: People in Benghazi are now tidying up. UPDATE 18:42 GMT: The Swiss government has announced its intention to locate and freeze any Gaddafi assets that may be held by its banks. UPDATE 18:31 GMT: Reuters is reporting that Libya’s Quryna newspaper says 23 people have been killed and 44 wounded in Zawiya. UPDATE 17:10 GMT: Rebels have occupied the center of a town near the capital and are laying home-made traps to fend off counter-attacks by pro-Gaddafi forces, a witness told Reuters. 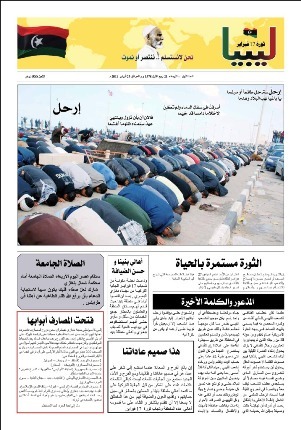 Other witnesses Reuters cited said spoke of heavy gunfire and chaotic scenes in the town of Zawiya. 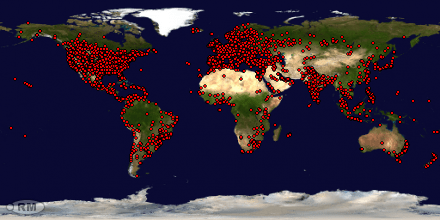 UPDATE 16:30 GMT: Multiple respected sources now estimating a death toll of 2000 killed so far. UPDATE 16:24 GMT: Muammar Gaddafi still has significant stockpiles of mustard gas and other chemical-weapons agents, raising fears in Washington about what could happen to them — and whether they may be used — as Libya slides further into chaos, the Wall Street Journal is reporting. “When you have a guy who’s as irrational as Gaddafi with some serious weapons at his disposal, it’s always a concern,” said a US official. “But we haven’t yet seen him move to use any kind of mustard gas or chemical weapon” during the unrest. UPDATE 15:24 GMT: Also from BBC: An editor there points out that Gaddafi’s speech included the line: “Zawiya is slipping away from us.” BBC says that there reports suggest Zawiya, west of Tripoli, has been the subject of fighting. CNN reported earlier today that the city has fallen to rebels. Zawiya is just 25 miles west of Tripoli. UPDATE 15:12 GMT: Reuters reported earlier today that Saudi Arabia has said it is “ready and willing” to make up for any shortfall in oil production resulting from the Libyan turmoil. UPDATE 14:16 GMT: AJE reports a witness from Zawiya is telling them at least 100 people had been killed when soldiers fired at protesters with heavy fire arms for five hours this morning. “The shooting was direct to the people. They shot the people in the head or in the chest,” he said. UPDATE 14:02 GMT: The New York Times is saying pro-Gaddafi forces are reported to be striking back in several cites surrounding Tripoli, as rebels crept closer to the capital and defections of military officers multiplied. In Sabratha, about 50 miles west of the capital where a government crackdown has been under way for several days, gunshots rang out as military troops filled the town, a witness said. UPDATE 14:00 GMT: A witness told Associated Press that the minaret of a mosque in Zawiya, a city 30 miles west of Tripoli where protesters had claimed victory, was blasted by heavy weapons in a morning attack, killing or wounding protesters who had been using the building as a refuge. UPDATE 13:54 GMT: We’re waiting for yet another speech from Gaddafi. Gathering updates in the meantime. UPDATE 13:53 GMT: Misurata, Libya’s third largest city after Tripoli and Benghazi, fell to rebel forces overnight. Misrata is 130 miles (210 km) east of Tripoli.